The bag's material meets the performance specification requirements of ANSI/ESD S541. 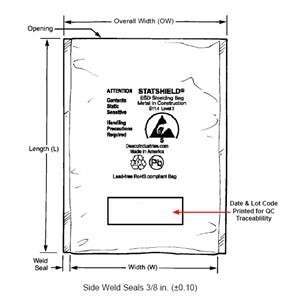 Per ANSI/ESD S541 section 8.2.1 Material Identification, "ESD protective packaging shall be marked with the ESD Protective Symbol." And section 8.2.3 Traceability "Packaging should be marked with information that allows traceability to the packaging manufacturer and to the manufacturer's date/lot code information. The date/lot code should allow traceability to quality control information pertaining to the manufacture of the specific lot of packaging. 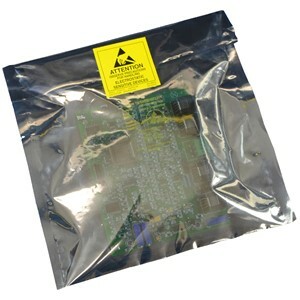 Recommend closings bags with ESD susceptibility labels. Per EOS/ESD S8 paragragh 3.1 ESD Susceptibility Symbol Application "The Symbol may be incorporated on a sticker used to close or seal ESD protective packaging to indicate that materials inside the package are ESD susceptible." 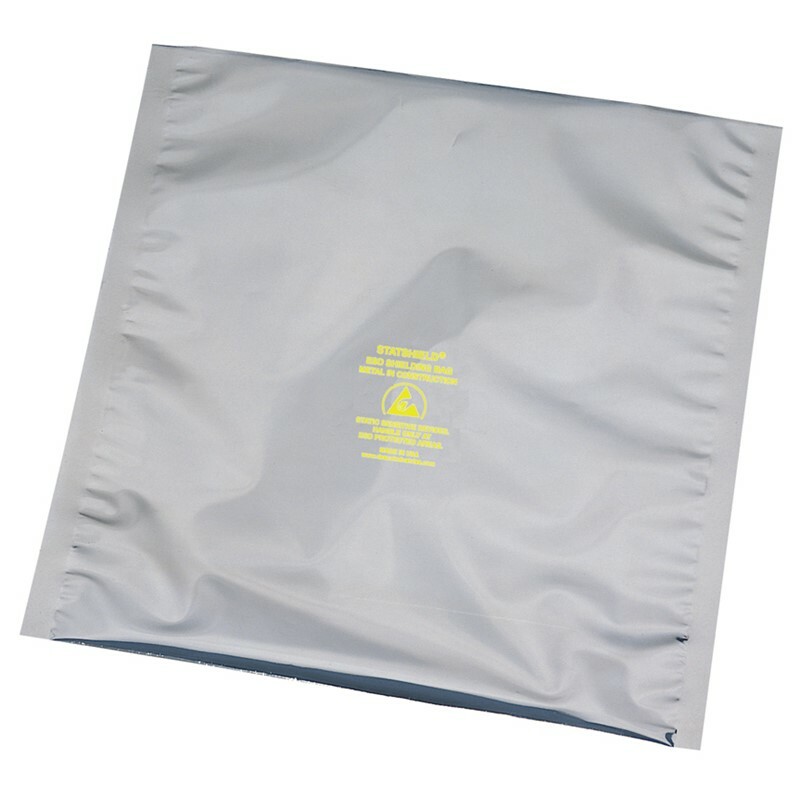 Use ESD bags to follow ANSI/ESD S20.20 fundamental ESD control principle: "Transportation of ESDS items outside an Electrostatic Protected Area requires enclosure in static protective materials; low charging and static discharge shielding materials are recommended. Mixed unsortable plastic scrap shall contain assorted plastics of multiple grades that are co-extruded, bonded or laminated together which are unsortable into individual grades. For best results, bag inventory should be continually replenished. It is recommended that standard packs of bags should be stored in its original packaging in a climate controlled environment where the temperature ranges from 45 degrees F to 70 degrees F and relative humidity is 50%. Bags should not be stored in ultraviolet sunlight, moisture, or heat because the aluminum shielding layer could oxidize if exposed to these conditions. We have no reports of degradation of ESD control properties of bags sealed in original standard pack packaging. Protektive Pak's Limited Warranty expressly warrants that for a period of one (1) year from the date of purchase, Protektive Pak products will be free of defects in material (parts) and workmanship (labor). 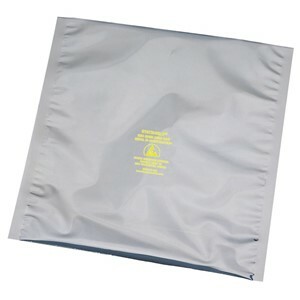 Before using and after one year from purchase date, users shall determine the suitability of the Statshield ESD Bags for their intended use. Users assume all risk and liability whatsoever in connection therewith. 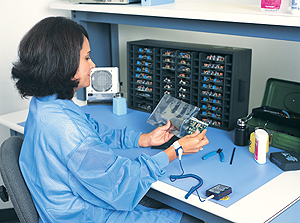 Mishandling or improper storage may render an ESD Bag unusable to perform its function. ESD Bags that are ripped, torn, or scratched should be discarded. From ANSI/ESD S20.20 section 6.2.4.2. 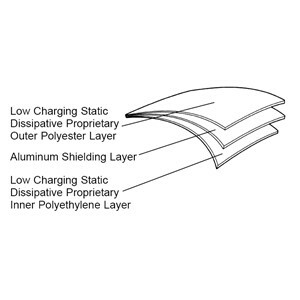 Packaging Guidance: "The objective of ESD protective packaging is to prevent a direct electrostatic discharge to the ESDS item contained within and allow for dissipation of charge from the exterior surface. In addition, the packaging should minimize charging of the ESDS item in response to an external electrostatic field and triboelectrification. They may also lose static shielding properties by crumpling, puncturing and folding." Some end users reuse a Statshield® Transparent Metal In ESD Shielding Bag up to six times and then discard. Ideally, the user should test, auditing some percentage of the re-used ESD Bags using test procedures outlined in ANSI/ESD-S11.11 Surface Resistivity Standard, ANSI/ESD-S11.12 Volume Resistance Measurements of Static Dissipative Planar Materials, and Shielding Materials ANIS/ESD S11.31. Protektive Pak's only obligation shall be to replace such quantity of the product proved to be defective. See full Limited Warranty information. “The Organization shall define ESD protective packaging for all ESD susceptible item material movement within Protected Areas, between job sites and field service operations.” See ANSI/ESD S20.20 section 6.2.4.1. Packaging Requirements. “ESD susceptible items shall be packaged in ESD protective packaging while not in a Protected Area.” See ANSI/ESD S20.20 section 6.2.3.1. Statshield® bags are packaged 100 per package in an oversized shielding bag rather than a cardboard box. Therefore, our bags are not exposed to water vapors that will degrade the metallized shielding layer. Our bags have an additional layer of barrier protection because of our packaging. Click HERE for complete Bag Selection Chart. Click HERE for Tamper Evident Bags.